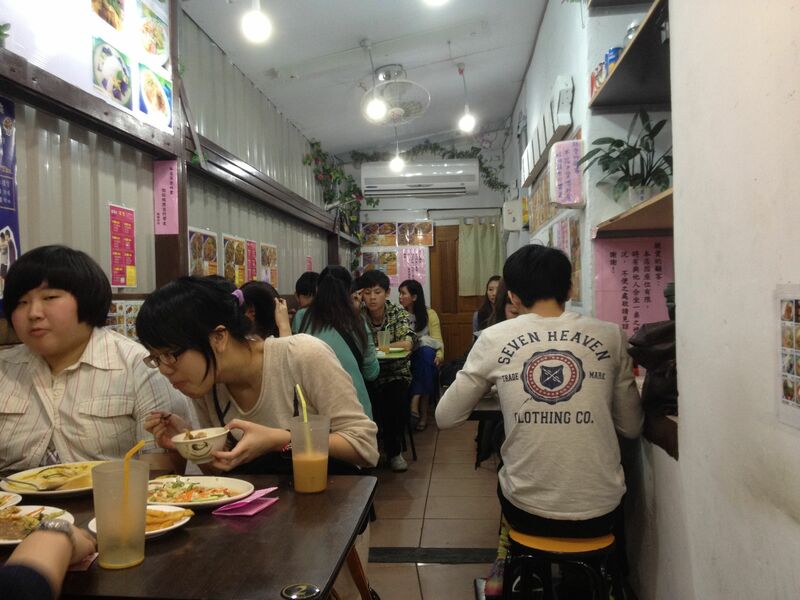 <300NT, 4 hearts, dinner, gongguan （公館), lunch, national taiwan university (台大), snacks., taiwanese, vegetarian. Okay. It’s been about a year since I last updated this blog. Terrible, I know. However, I will try to do better. It’s June in Taipei, summer is fast approaching, and well, it’s muggy out. Perfect time to eat some cold noodles. The first time I went to Xinglong was sometime last fall. I meant to write something about it then, but obviously that did not happen. 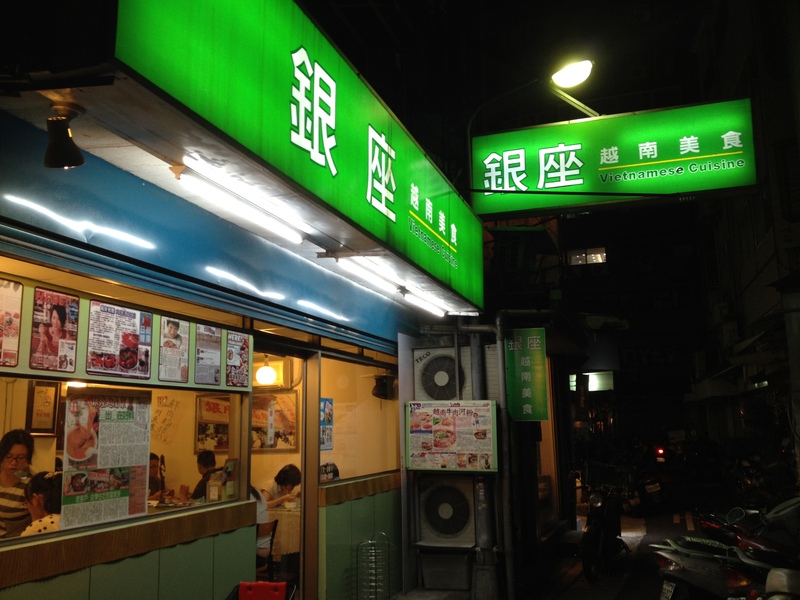 Located near National Taiwan University (NTU [台大]) in Gongguan (公館), Xinglong is located in alley 333 off of Roosevelt Road. If you’re coming from the MRT Gongguan Station, take exit 3 and head north on Roosevelt towards MRT Taipower Building. You’ll need to cross Xinsheng North Road (新生南路) and continue north on Roosevelt–alley 333 will be your first right. When you hit the fork in the road veer right–you should see Xinglong on the right. 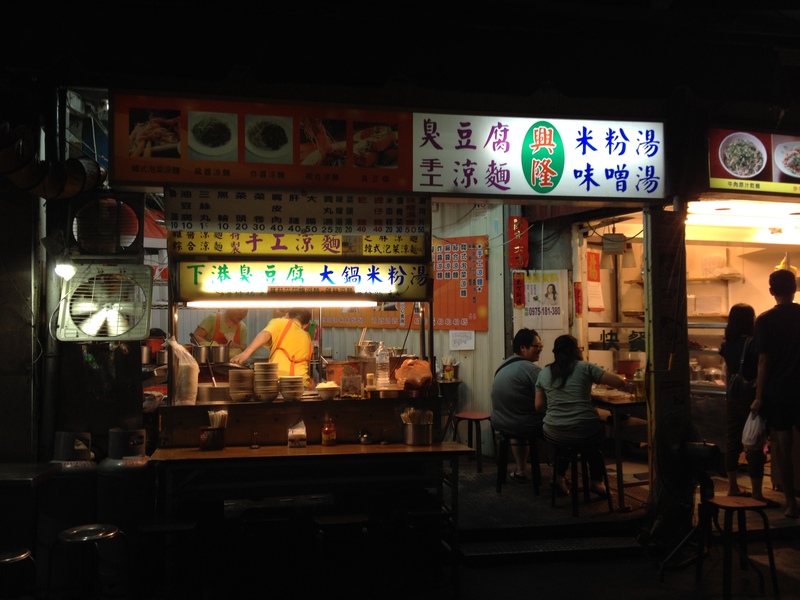 Alternatively, you can make a right onto Xinsheng (on the side of the street opposite NTU) and make your first left–the “restaurant” will be on the left. As you can see from the outside shot of the shop at the top of this post, Xinglong is just a little stand on the side of the road. There are a few tables inside and a few outside. In terms of cleanliness, this place is like anything else you expect to find on the side of the street: clean enough to eat at, but I wouldn’t eat anything off the table. The menu is all in Chinese. Ordering is done through a standard order sheet where you mark what you want. 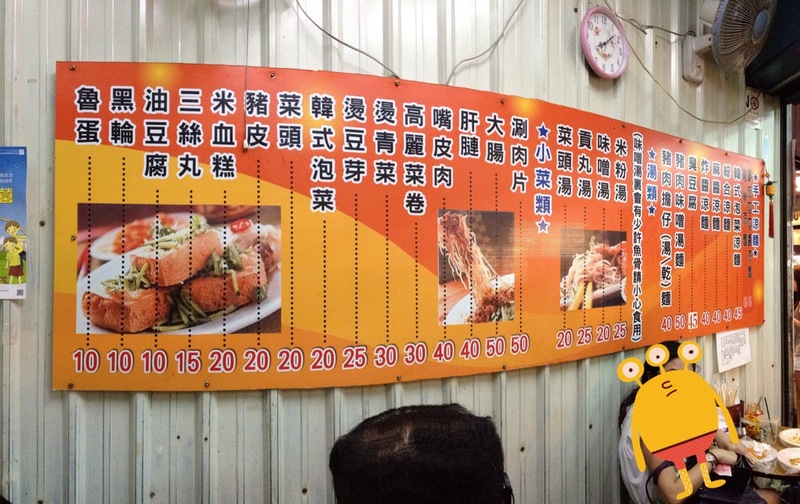 There is also a menu on the wall (also in Chinese). There are a few random photos of food around, but nothing that helpful. 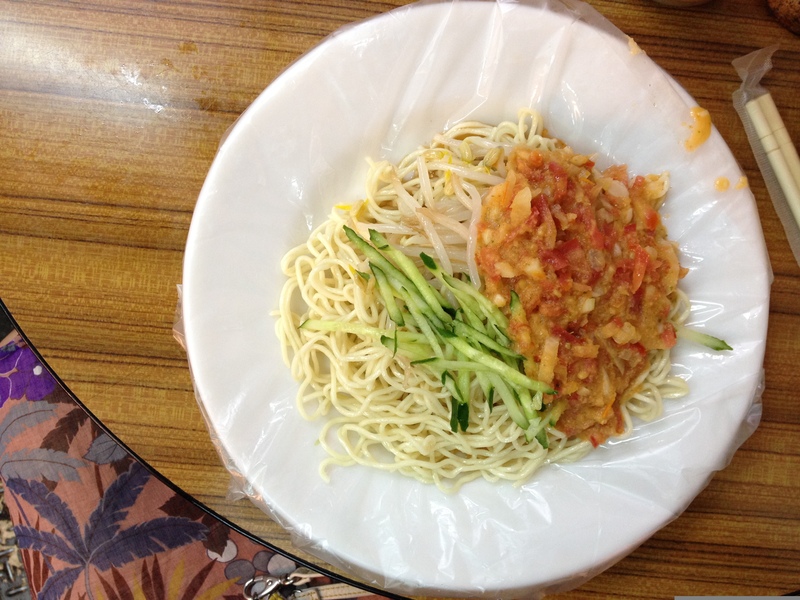 Really, this place stands out because it has something I’ve never seen before: cold noodles with tomato “salsa” (蕃茄沙沙醬涼麵). For 45NT you get a plate of cold noodles served with shredded cucumber, bean sprouts, and most importantly some tomato “salsa.” Now I put salsa in quotations because if you’re American like me, I’m guessing when you hear the word salsa you start thinking about Mexican food. This is not that. It is, however, fresh tomatoes, garlic, and some other stuff mashed into a salsa-like sauce. Mix it all up, throw on some chili oil if you like (which I do) and eat. On a hot day, this perfectly hits the spot. It’s light and pretty refreshing. The portion size is probably too small to be a meal in itself, but you can order some side dishes to supplement that. 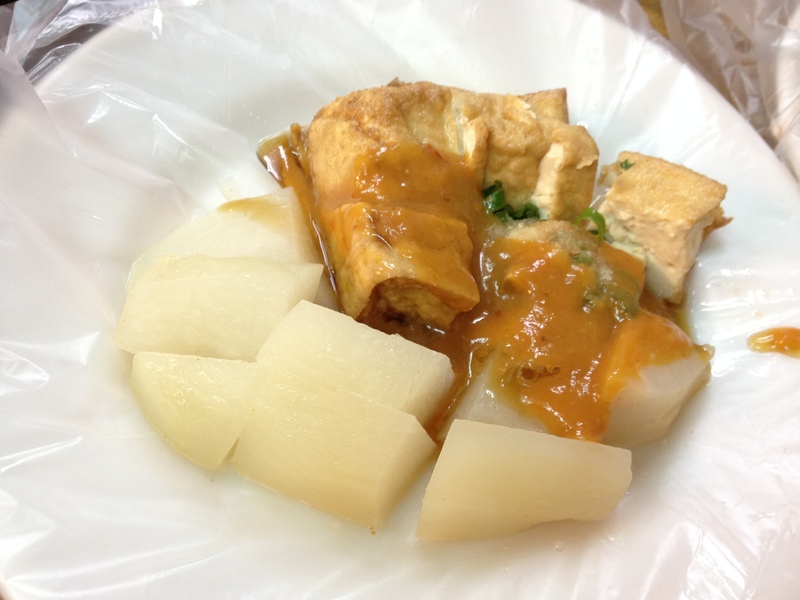 We decided to get some braised fried/oily tofu (油豆腐) and radish (菜頭). Again, the serving size is pretty small, but good enough for a nice side dish. Both the tofu and radish were good. Add some chili oil (if you are so inclined)–it adds a nice little kick. Overall, this place is pretty great for a light meal or snack on a hot day. Really, it’s pretty good for a non-hot day too. 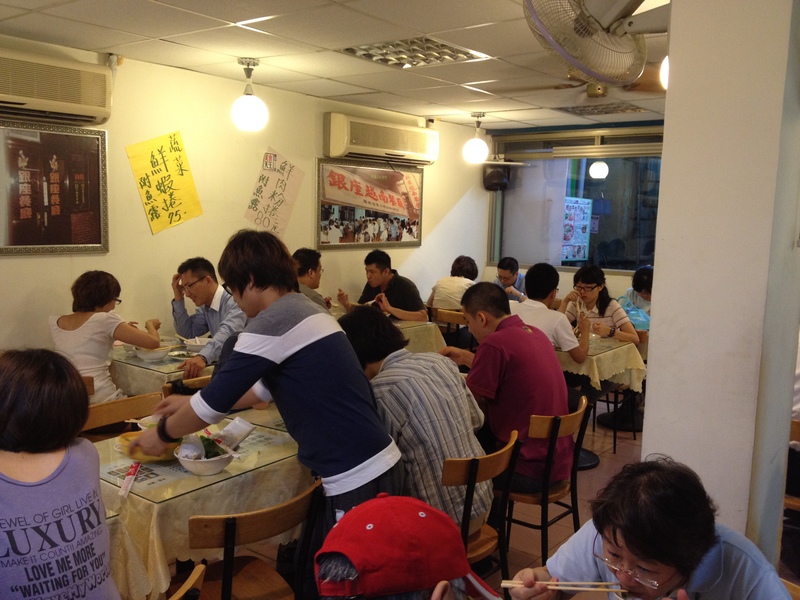 The first time I came here my friend and I split an order of the fried stinky tofu (炸臭豆腐). The tofu was pretty standard fare–not stinky enough for my particular taste, but okay. Really, the best thing is the cold noodles with “salsa.” Very tasty. I kind of love it. 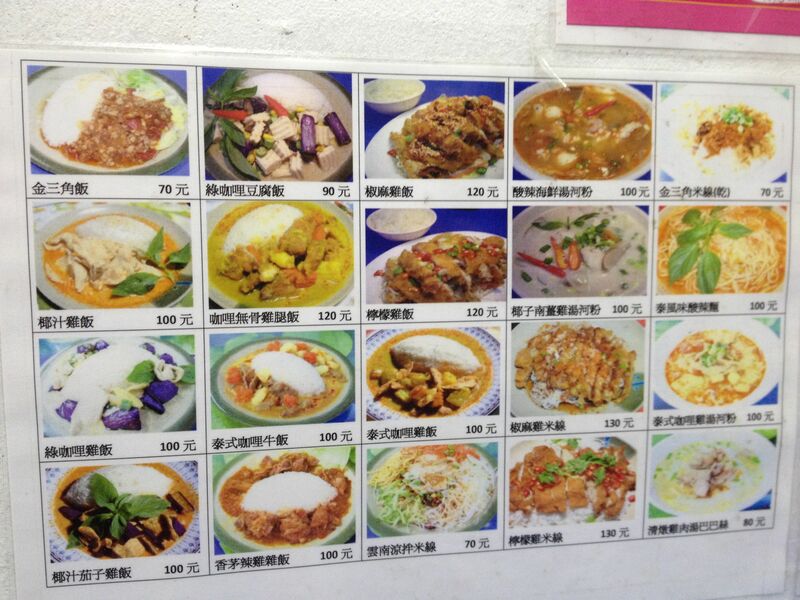 <300NT, 5 hearts, curry., dinner, favorites, gongguan （公館), lunch, national taiwan university (台大), thai. All pictures taken with my iPhone 4S. Anyone that has walked around the Gongguan/NTU area will probably notice the disproportionate amount of Thai restaurants in the area. It seems like there are at least 2 Thai restaurants to every 1 of any other style cuisine. Even with so many Thai places, I’ve actually tried very few having found favorites that I continually go back to. However, in an attempt to try new things to blog about I wandered into 泰風味小吃店 (roughly translated as Thai-Style Restaurant). Finding 泰風味小吃店 isn’t too bad. It’s in the alley on the next to the Shuiyuan Market building (水源市場) outside of exit 1 of MRT Gongguan station. It’s in the alley to the left of building if you’re heading south on Roosevelt Rd. (羅斯福路). You can see a large purple sign that says Thai Food on it (it is next door to a branch of the dumpling chain 鮮天下, which has a green sign). The large purple sign looks quite generic, which at first was off putting; however, after seeing an ample amount of patrons go in and/or get something to-go I figured why not. The restaurant itself is nothing special to look at. 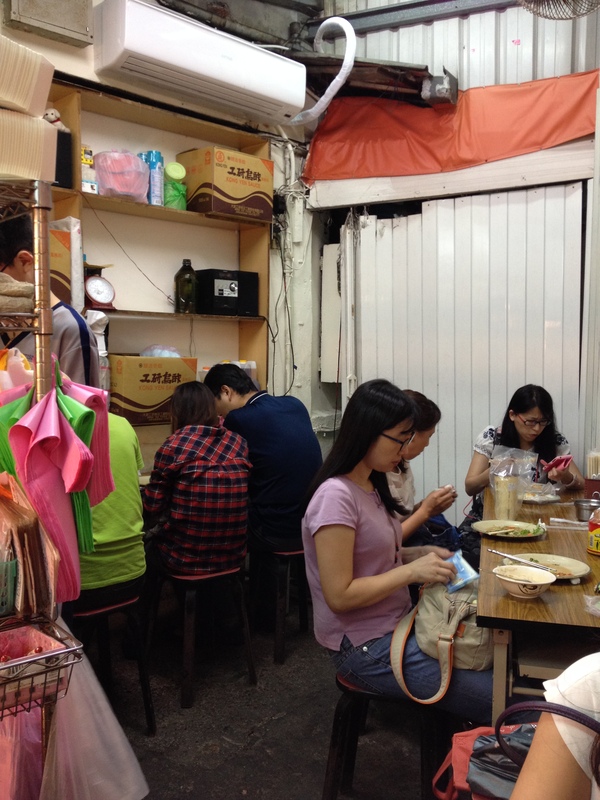 It’s pretty much the definition of “hole-in-the-wall”: it’s very narrow, with small tables lined up against the left and right side and not particularly the cleanest or prettiest to look at. I happen to be a believer that these types of mom and pop shops often have the best food, and I found that in the case of 泰風味小吃店 I was right. 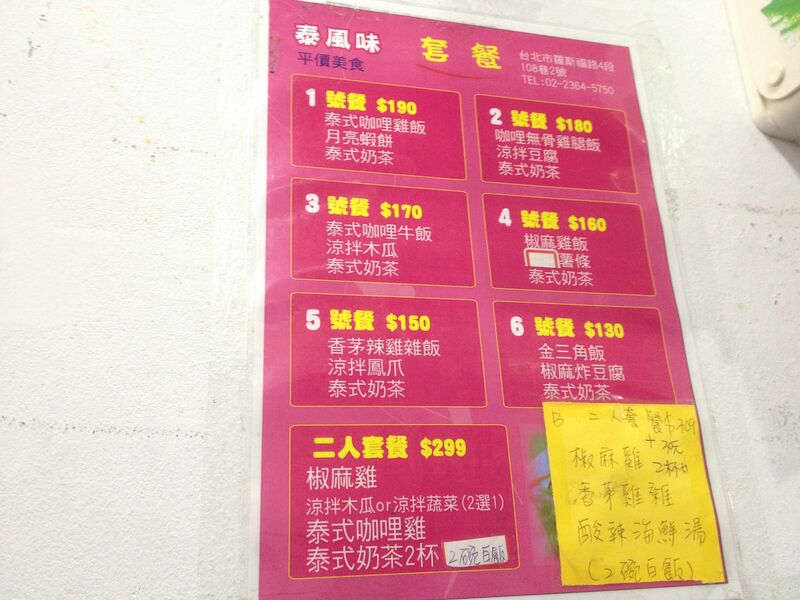 The menu is a standard Taiwan-style mark the menu deal in Chinese only. There are pictures of some of the dishes on the wall, but not all. I saw quite a few foreigners come in and it looked as though they have an English menu; however, it didn’t look like it had all the menu items on it. In addition, they have several set menu options (also in Chinese). 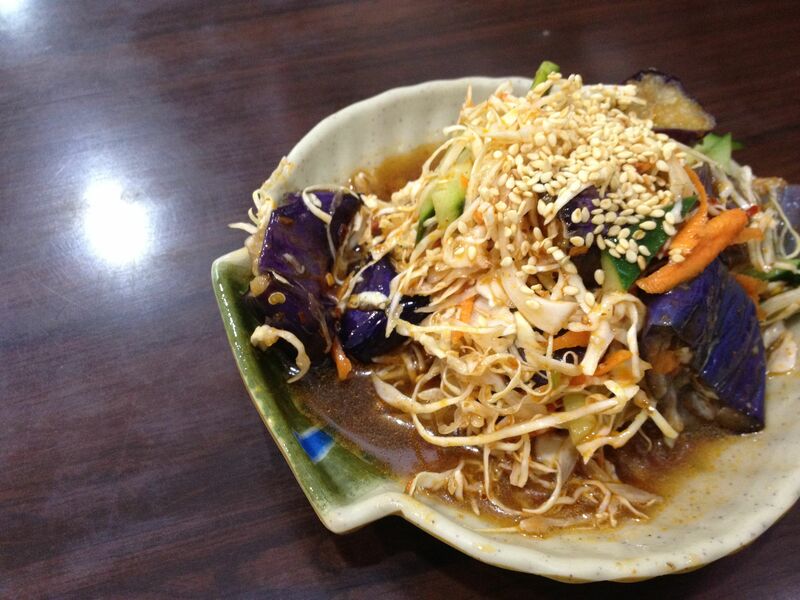 The cold eggplant was pretty delicious. I happen to love eggplant, which I’ve probably mentioned a thousand times, and this little side dish did not disappoint. There was definitely a spicy kick, but there was great flavor in the sauce: a little sweet, a little sour, a little spicy. Be warned, for me “a little” spicy might be very spicy for those particularly sensitive to heat. 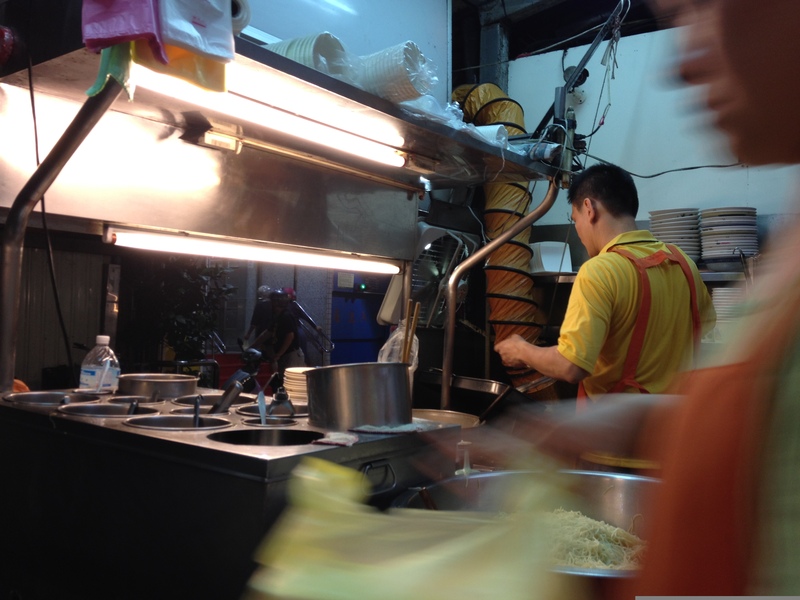 My latest trip to 泰風味小吃店 had me ordering the thai-style pepper chicken with rice noodles. I love pepper chicken (aka jiaoma ji) and get it often. I generally prefer noodles to rice; however, jiaoma ji generally comes with rice. I was happy to see it come with rice noodles, which is why I had to try it. The jiaoma ji here was really good. It was pretty spicy, a good spice to me, but, again, likely very spicy for someone sensitive to heat. The sauce was delicious: good balance of sweet, sour, salt and spice. The chicken also didn’t taste particularly greasy for being fried. The overall combination of the chicken and sauce with the noodles was great. There weren’t a whole lot of noodles, so for a super hungry person, or someone that likes a lot of carbs with their meal, this might not be filling enough; however, for me, it was the perfect size. I will definitely be getting this again. 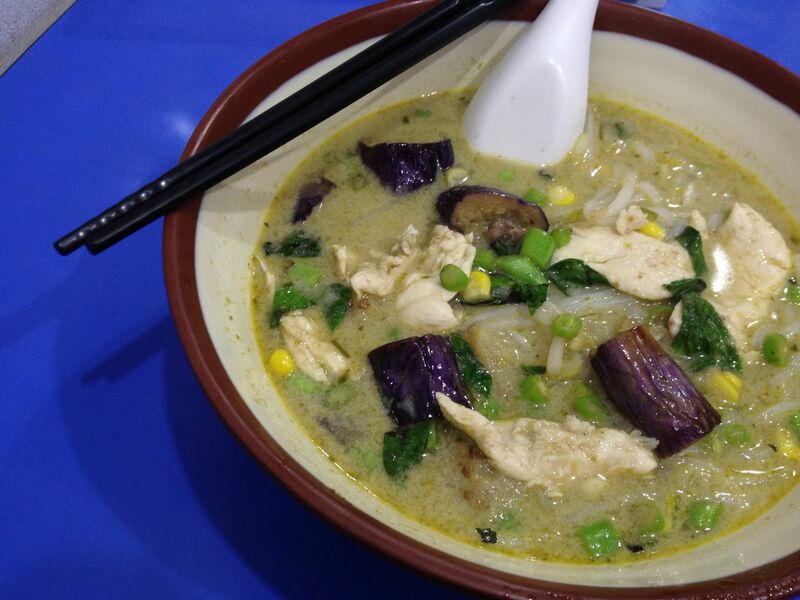 On a previous visit I tried the green curry chicken soup with Thai rice vermicelli. There is another place in Gongguan that I always get this dish from. It’s my “go to” place for green curry chicken soup. However, upon seeing it on the menu here, I figured I should try it for comparison (plus, it’s 50NT cheaper than the other place). Boy was I glad I tried it. I thought the green curry soup here was delicious, maybe even better than my other place. The soup here is basically just a slightly less thick green curry sauce. It was pretty spicy, definitely not for someone with a sensitive palette. The chicken was super tender and the soup had great flavor. Vegetable-wise there was corn, green peas, eggplant, and bean sprouts in the soup. They have five different choices for the type of noodles you can put in your soup. I asked a server for which one they though was best with the green curry soup. 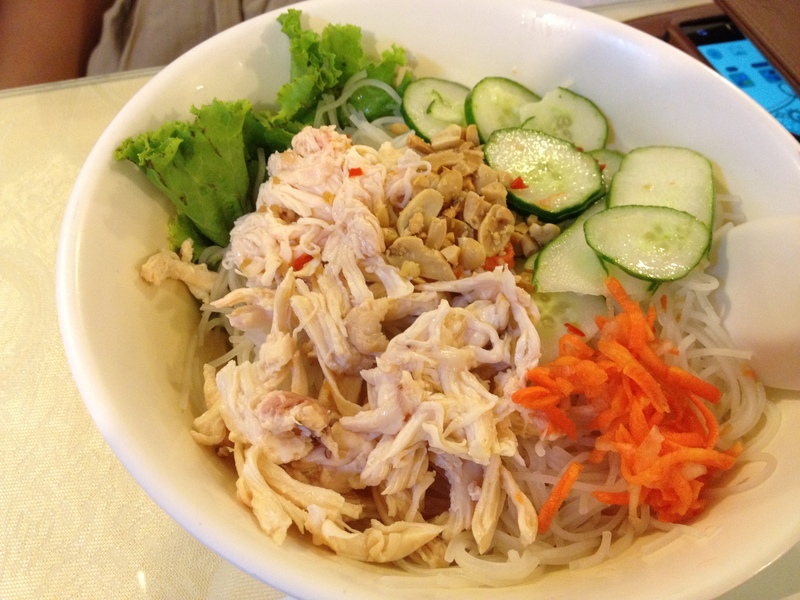 He recommended the 巴巴絲 (bābāsī/Thai-style rice vermicelli). 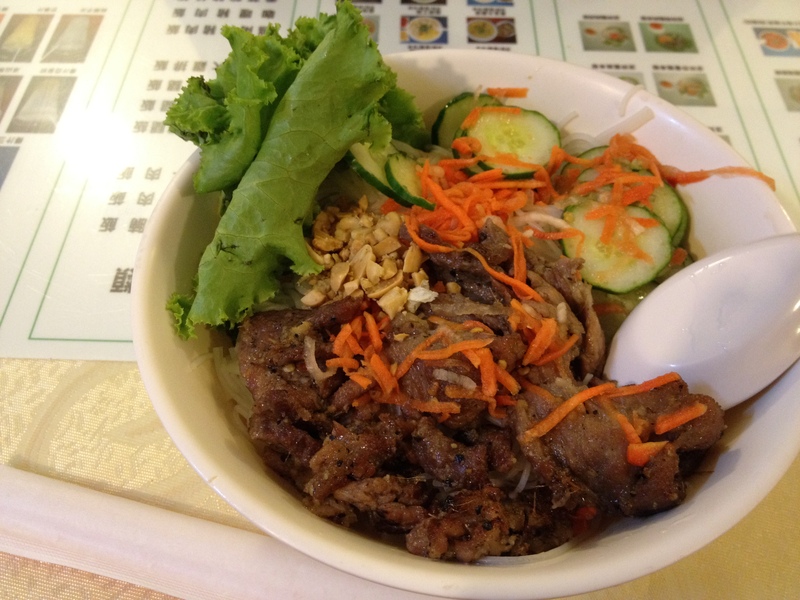 The texture was basically identical to other types of rice vermicelli and a perfect match for the soup. This is another thing I will definitely be getting again. The first time I came to 泰風味小吃店 was because I was craving tom kha kai and hadn’t found a good one that I liked in Gongguan yet. I saw it on the menu and decided to give it a shot. I thought it was pretty delicious, perfect for a cold night. You can get it with noodles, but I just got the soup (note that without the noodles it’s still the same price). The balance of the lemongrass to galangal to coconut milk to kaffir lime leaf was great. The soup felt really warm in my stomach and was just really comforting. The chicken was tender, too. There have been times that I’ve had tom kha kai and thought it was too heavy, too thick to drink a whole bowl of, but this one was not. It wasn’t watery, but it was not so heavy that you felt like you were drinking straight coconut milk either. Very good. Overall, there was something about this place that tasted a little more local Thai to me (and yes, I’ve been to Thailand). Maybe it’s because it’s spicier than most other Thai places I’ve been to in Gongguan or there is just a certain flavor I get more of here…I’m not quite sure. With the plethora of Thai joints in Gongguan I’m sure that everyone has their favorites, but 泰風味小吃店 has definitely won me over and earned itself the title of one of my favorites. <300NT, 3 hearts, dinner, gongguan （公館), lunch, national taiwan university (台大), vietnamese. I’ve passed by Yinzuo Vietnamese Cuisine many many times, as it’s located two doors from Sawasdee, one of my favorite cheap go to Thai places in Taipei, and every time I think, “I need to try this place.” I finally did. Undecided on what to eat, Erin and I decided we wanted Vietnamese and this was the nearest place I could think of to my apartment. Usually when I pass by Yinzuo on my way to Sawasdee it’s pretty full. The random Tuesday night we went was no exception, although the turnover seems pretty quick so I doubt a wait would be long. 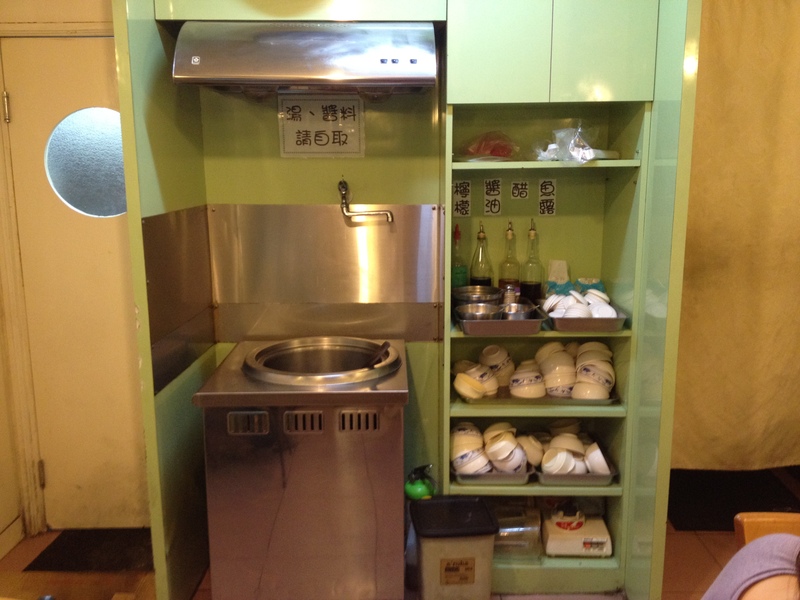 The inside of Yinzuo is clean enough, pretty typical for the mom and pop type restaurants in the Gongguan/NTU area. Tables here are pretty close together so it might feel like you’re eating with the party next to you, we know we did. At the back of the restaurant is a self serve area with soup, sauces, and extra tableware/utensils. We didn’t get any soup, but it looked like pretty standard seaweed soup. 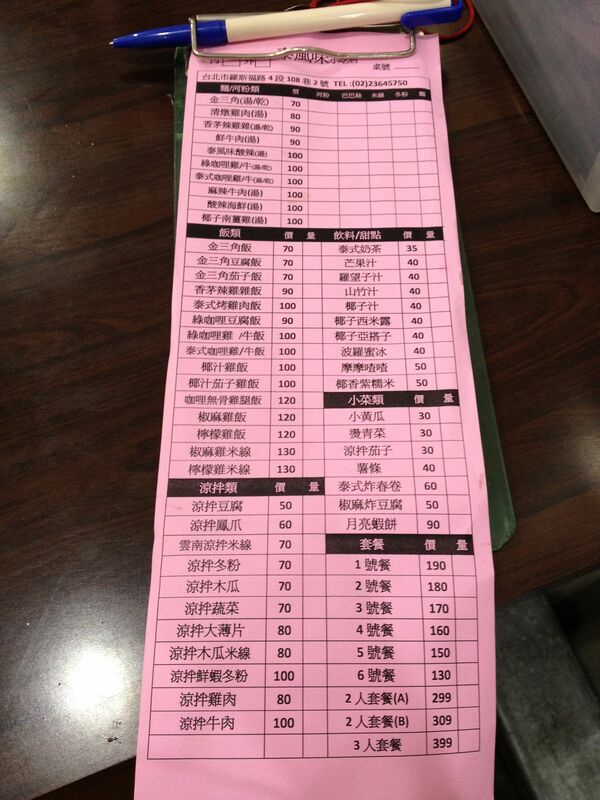 Like most of the restaurants in the Gongguan/NTU area, the menu is all in Chinese. 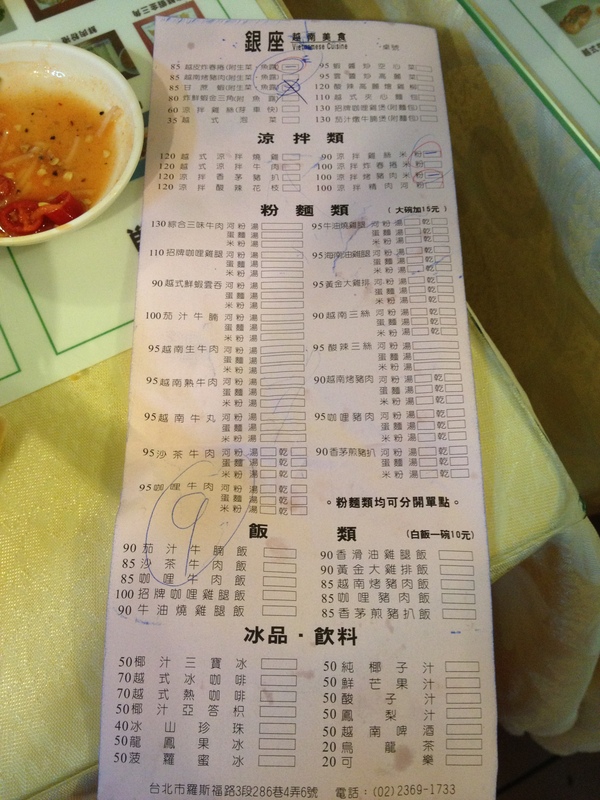 Their menu is divided into sections (from top to bottom): appetizers, cold dishes, noodle dishes, rice dishes, and beverages. Each table has a picture menu under the glass as well. While not all items are pictured, a large majority are. Note that there is no English on this picture menu. 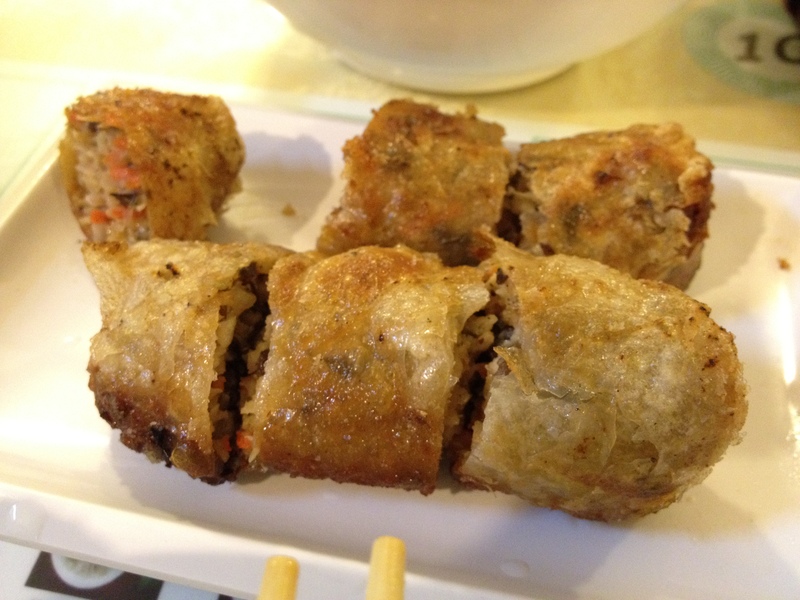 We decided to get an appetizer of the fried spring rolls (越皮炸春卷) for 85NT. One order comes with two spring rolls that have been cut into three, for a total of six tasty pieces. The skin on these spring rolls is nice and thin and fried so that it’s crispy; they are filled with a noodle, pork, and vegetable mix; very tasty. Be sure to dip it in the accompanying fish sauce mixture. I opted for the cold rice noodles with BBQ pork ((涼拌烤豬肉米粉) for 100NT. For 100NT you get a bowl of cold rice noodles (米粉) topped with BBQ pork, slices of cucumber, shredded carrots, and crushed peanuts. The fish sauce concoction that usually accompanies cold noodle Vietnamese dishes is added before the dish comes out to you. Overall I thought this was good, but not particularly awesome. There was something a little bland about the fish sauce mix, which is strange to me because fish sauce usually has such a strong flavor. The BBQ pork itself was pretty good and the dish comes with a decent amount. All together I guess there was just a certain something lacking in the sauce to noodle to topping ratio that would have made this awesome. Still though, pretty good. 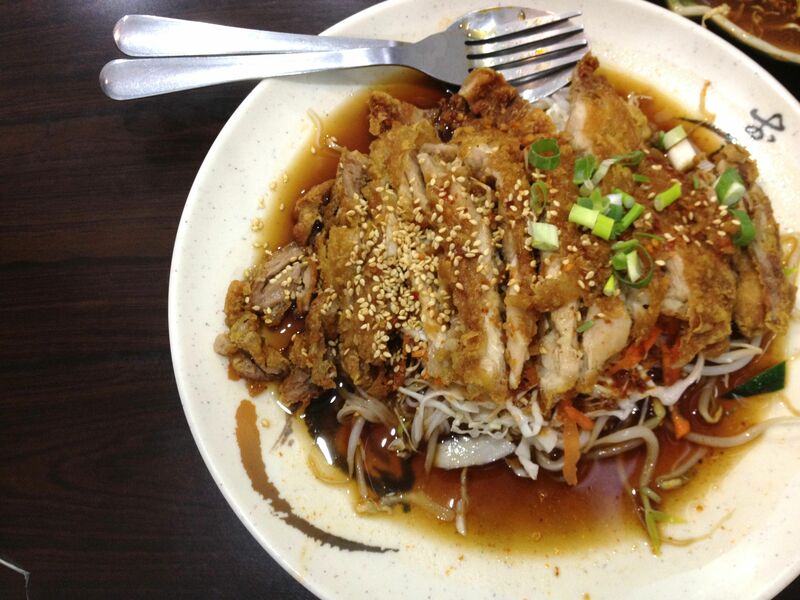 Erin decided to get the cold rice noodles with chicken (涼拌雞絲米粉) for 90NT. With the chicken comes some sliced cucumber, shredded carrots, and peanuts. She had the same thoughts I did about my food: good, but lacking something. According to the menu, their signature dish is chicken curry (咖喱雞), but for some reason neither of us got it so maybe I should go back and try it. Overall, for the price the food here is pretty decent. There are definitely other things on the menu that looked good and this place is always busy, which is a good sign. Maybe I’ll go back and try something different. <300NT, 3 hearts, by rating., dinner, genre., gongguan （公館), mrt/area., thai. After walking around Gong Guan for a while weighing our options we decided on 曼谷燒 (Màngǔshāo) or Bangkok Fever (or not. shāo has so many definitions, to cook, to roast, to burn, fever, so I just picked the one I liked best). One of the reasons we picked it was because there were a lot of people waiting to eat there, so we figured it had to at least be decent for people to wait. 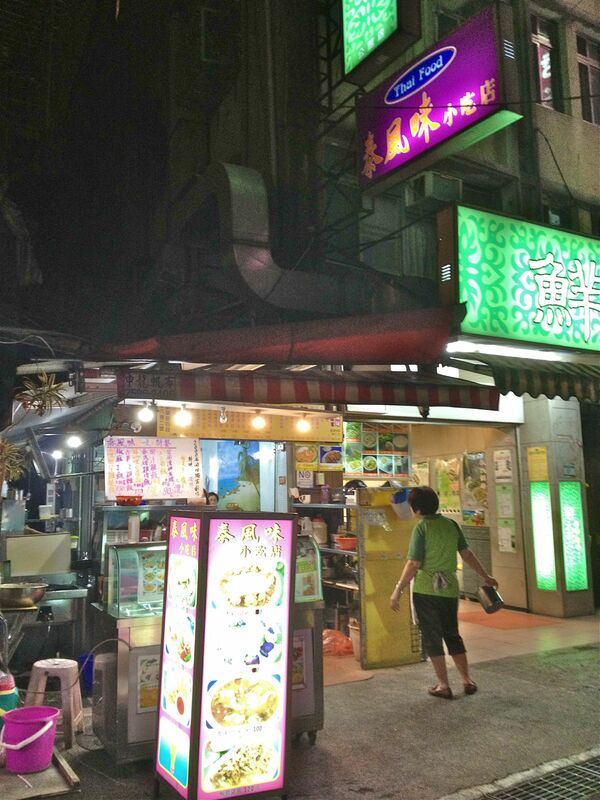 Bangkok Fever is located right next to the famous Taiwanese sausage wrapped in a rice sausage place in Gong Guan. The restaurant is very small only fitting maybe 15 people max. There is another Thai place right next door. It is NOT the same place, and I’ve heard that place is not good. Anyways, you have to order first. 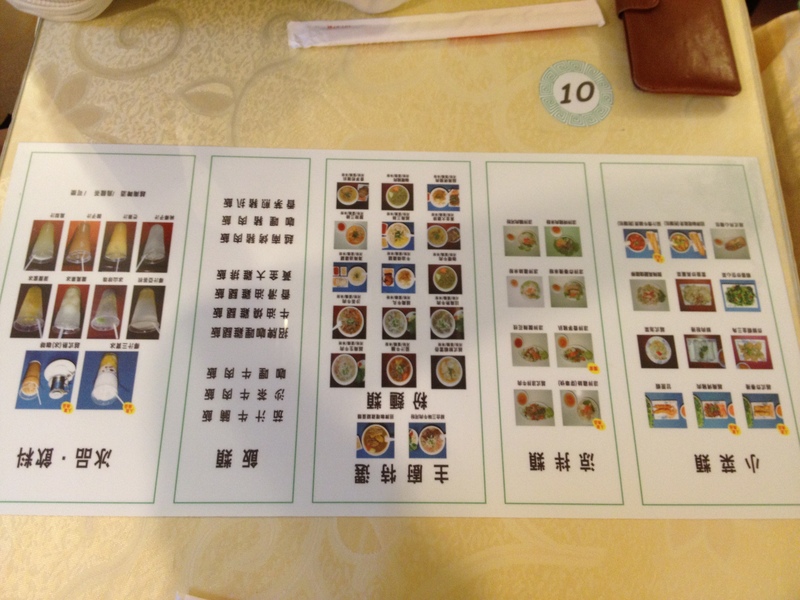 The menu is in Chinese and English and there are pictures of most of the items. I went with the Combo #1 Coconut Curry Chicken and BBQ Pork 110NT (1號餐 椰汁雞＋烤肉飯) while Dan opted for the BBQ Pork meal 85NT (泰式烤肉飯). There is free water, hopefully not tap, but way better is the free Lemon Ai-yu stuff (愛玉佞檸檬). Our food came pretty quick and it was tasty. Both of our dishes came with slightly different sides. The sauteed bean sprouts and mixed tofu thing were really good on mine. The sauteed greens could have been better; they were just too bitter for my taste and not cooked enough. The curry was good IF you like ginger, which I happen to love. You couldn’t really taste the coconut at all, it was more like ginger curry, but the chicken was good and the curry was tasty. The bbq pork was really good too. Tender and really flavorful. My one complaint is that they don’t give you very much meat. I could have done with less rice and a more meat, but I guess that’s why it’s cheap. One thing Dan got that I didn’t was this really tasty piece of deep fried onion. I love onions and this was a nice suprise. Dan’s dish also came with the Thai style kimchee which was good, kind of sweet, but good. Overall this place is decent. Give it a try if you quick good food. I wouldn’t exactly classify this place as “authentic Thai food” but it’s good, and if anything the free Lemon Ai-yu is worth it.